Download free content to share on social media, newsletters, websites, or wherever you'd like - to help us take on the epidemics of obesity and diabetes. PGP purchases information on beverage sales data. Data are purchased from IRI, a market data firm that contains the world’s largest set of purchase, media, and loyalty data. IRI is commonly used by for-profit industries - including beverage companies - to understand market performance and retail analytics, consumer insights, and ad performance. PGP is the first organization to use sales of SSBs as a metric for SSB campaign success. 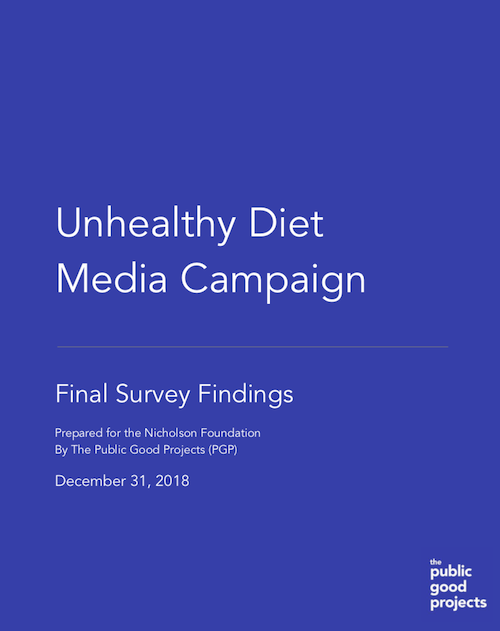 PGP utilizes a technology tool for monitoring online content and traditional media conversation around sugar-sweetened beverages and changes in this conversation among the general public/ within media coverage and reporting. Data are collected using a third-party program, Zignal (www.zignallabs.com), which employs a combination of techniques to ingest public data and structure it for analysis. Public data include various media sources such as social and digital media (Twitter, Instagram, and Facebook), YouTube, online forums, online Q&A websites, news sites and blogs, print media such as journals, magazines, and newspapers, and broadcast television. Data from Zignal are used to monitor and evaluate the ways that SSBs are discussed online over time. PGP conducted baseline and follow up evaluation surveys to understand trends and changes in knowledge, attitudes, and behaviors (KABs) related to SSB consumption. A substantial decrease in the sales of fruit drink mixes, sports drinks, and sodas/ soft drinks. Positive trends toward increased self-reported water consumption and decreased soda consumption. Survey results also showed decreases in those who frequently have SSBs available in the home, as well as a decrease in perceived acceptability of allowing children to consume soda. An increase in media conversation related to SSBs across New Jersey, both during and after the campaign. Conversation monitoring also showed increases in messages related to campaign topics, particularly the importance of choosing water over SSBs. This pattern was not observed at the national level, which remained flat throughout the data collection period. Click on the images below to access content for the following campaigns. Powered by PGP and The Nicholson Foundation.